The best compilation of X-Men I’ve read so far. At times it seems a little thrown together, especially with the annuals, who’s stories are usually disjointed from the main plot. However, these ones knit together nicely.Finally seeing Scott and Jean tie the knot has been a long time coming! That’s 30 years of continuity time coming!! I really think they did the event justice in the book and everything went off without a hitch 😂That’s so odd for an X-Men comic!! I’m probably looking at this with some sentiment as I’ve always rooted for Scott and Jean but I know it’s not meant to, and never truly going to be but hey, just as they say at the start of every new x-man’s entrance “I hope you survive the experience.” I the romance didn’t, well it flourished for a couple of years at least...The artwork is beautiful, even though I’m still not the biggest fan of John Romita JR’s artwork. This collection covers an event that X-Men fans have waited for since the beginning of the series- Cyclops and Jean Grey are finally getting married :-).Along with the wedding issue, this collection included some of the events surrounding the great event, including the arrival of Sabertooth at the mansion (for help controlling his bloodlust).One of my favorites was What If #60, which presented three different scenarios regarding the wedding. In the first, Scott and Jean got married sooner, and left the team at the same time Hank McCoy left with tragic results. In the second, Jean never noticed Scott and fell for the Angel instead, with unexpected repercussions for the team as a whole and for Scott personally.In the third, Phoenix turned away from Scott and took up with Wolverine. When she inevitably turned into Dark Phoenix, it didn't go so well for all involved. I know that the X-Men comics (indeed, most superhero comics) are very much a soap opera, but these issues take that to the extreme. There's way too much dialogue here, and little of it interesting. During the '90s, after Claremont, the X-Men was wildly uneven. This is the story of two authors: Fabian Niceza and Scott Lobdell. The Lobdell stories are in general good character pieces, while the Nicieza pieces drag and are more mediocre. From another point of view, this volume has a good wedding and a mediocre storyline involving Sabertooth.Legacy (X-Men A2, X-Men 27). It's good to see an annual that actually continues the story of the main comic, and the second adjective less X-Men annual does, rather than offering a random one-off or some random event. And, it's a pretty good story, advancing plots about Revanche and the Brotherhood while also offering one of the better looks at the Legacy virus — about what it's doing to mutant kind and how some may take advantage of it. [6+/10]. The Legacy focus continues to good effect in the main X-Men comic, with good moral dilemmas involving Sinister and nice continuity with Infectia [6/10].Sabertooth (XMU3, X-Men 28). The Sabertooth plot starts off in Unlimited with a nice plotline: the rehabilitation of Sabertooth. Unfortunately, it's over stretched and dull there, and the artwork is shockingly amateur. [3/10]. When it moves over to X-Men, the same problems continue: Nicieza envisions an interesting arc, but doesn't interest us getting there — though thankfully the X-Men issue has other stuff going on too [5/10].Charles (UXM309). I've often felt like Professor X held the X-Men back, but this is a fine example of how he could be used to tell interesting stories, as we learn of his past with Magneto and more notably with Voigt. It's all interesting backstory and interesting character revelation. [7+/10]Hellfire (X-Men 29). I could do without the never-ending focus on Sabertooth, who Nicieza still has not made interesting, but otherwise this is a nice character piece contrasting Shinobi, Warren, and Betsy ... though nothing really happens [5/10].Caliban (UXMA 18). Oh hey, Caliban kidnaps a young girl. Except the difference between this annual and Caliban's kidnapping of Kitty back in the '80s shows how wrong comics had gone in the '90s. The original comic was a nuanced story about (creepy) love, but this one is all about death and killing. Writing is pretty meh too, and it links to the ever-annoying Sabertooth plot (though this one-off writer is better than Nicieza about dealing with it). Still: a waste of an annual. [4/10]Cable (UXM309). Great to get the long-awaited scene between Cable and Scott just before the wedding. Yeah, there's a stupid fight with stupid '90s guy X-Cutioner, but the rest of the issue is a very nice piece of Cable continuity [7/10].Scott & Jean (UXM308, Album, X-Men 30). And finally, the main event! It's nice to have a great look at Scott & Jean's relationship a few months early in UXM308. It really convinces me of their love, and is a great look at the X-Men as family, calling back to Claremont's days. This would be a perfect issue if JR jr hadn't randomly insisted on drawing a quarter of the pages sideways, which was a problem throughout his issues here [8/10]. The Album that follows has some nice bonding between Jubilee and Jean, but also dull (and poorly formatted diary entries). The result isn't worth much [4/10]. The actual wedding is just joyful sappiness [7/10].What If? (60). A nice walk through X-Men history, but these stories are too short to have any depth [5/10]. Rather a hodge-podge of a collection. Still, it's an utterly lovable one. Some great issues of JRJR's timeless looking wonderful artwork. There's some really great moments in this book. The chapter focusing on Charles is one of Lobedell's best pieces I've ever read. Scott also get the focus in another issue. And we learn some new insights and new emotions are touched upon in the Summers clan as Scott and Nathan realize their true relationship to one another. Jean of course gets her chance to shine as well. I paid a pretty penny for this one and had in mind to sell it on to regain that cost. But no, this one's a keeper. This is a great period for the X-Men and one I'll return to read again. This is a Must Read for all X-Men fans. An interesting tale of the love between Scott Summers and Jean Grey. I wish this comic was not as random in the different tales that I read about, but the main story was obviously the engagement and marriage of the two. I want to read more a out the Legacy Virus that they mention heavily throughout the book. I found the inner thoughts of Charles Xavier highly interesting. The reader can see that Charles loves his young mutants, but he also feels like he has give up much of his life for them. He has missed many chances at his own happiness. This is the X-Men with which I grew up and which was presented to dozens of young kids like me (albeit in a watered-down version) as a Saturday morning cartoon. As an adult I've gone back and collected all of the Essential volumes, so seeing Scott and Jean married was rewarding for me. It's a little ruined for me knowing what comes after. Just finished reading and it is truly possible to travel in time through comics!! Amazing dialogues, good to see how things were when the X-Men were dealing with a lot of different issues, personal or otherwise!! plus: i really miss when they're fighting in their casual clothes rather than just in uniform! ( weird i know lol)! absolutely LOVED IT!! The actual wedding issue was good, but the rest of it - with so many different art styles and disparate storylines - felt like a mishmash of filler to bulk up the book (and it's price tag). 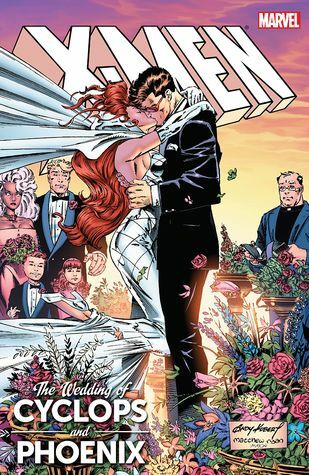 Just buy the single wedding issue (X-Men #30) and skip the rest. Fabian Nicieza Scott Lobdell Glenn Herdling Kurt Busiek Richard Bennett Andy Kubert Aron Wiesenfeld Ian Churchill - Fabian Nicieza is an American comic book writer and editor who is best known for his work on Marvel titles such as X-Men, X-Force, New Warriors, Cable and Deadpool, and Thunderbolts, for all of which he helped create numerous characters.